When purchasing or selling a moped, you always want to document the transfer of vehicle from the seller to the buyer. Typically this is done by signing the “Transfer by Owner” or “Assignment” section of the rear of the original title. We also suggest securing a valid bill of sale to properly document the sale including the sales price, condition of the vehicle, and hold harmless language to protect the buyer and seller. 1. Mopeds can vary in price from hundreds to thousands of dollars depending on the make, model and engine size. With cheaper varieties, a bill of sale may not be necessary because the likelihood of someone making a claim against your ownership is minimal. However, when you are exchanging a large sum of money a proper bill of sale can protect you from someone claiming ownership after your purchase or claims made for injury or damage after the sale. 2. Some states will require the moped be registered with the state if the engine size exceeds 50cc. To register a vehicle in your name, you need proof that you are the rightful owner. 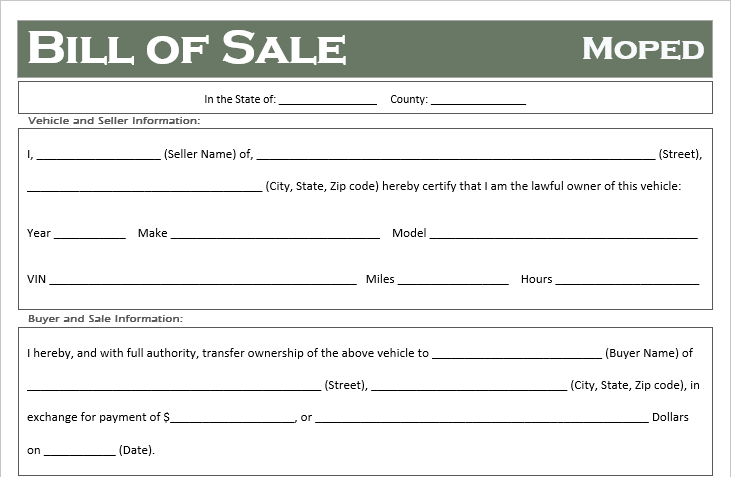 Without a title, most will states accept a bill of sale as ownership and will allow you to apply for the new title. Offer: The agreement to exchange the moped for an amount of money. May also include conditions of the sale for the buyer and the seller. After you have made your purchase and received an executed bill of sale the first thing you should do is put it in a secured location. This will ensure it isn’t damaged or lost when it comes time to prove your ownership or sell the moped. We also suggest both the seller keep a copy of the Bill of Sale, and the buyer keep the original. This will ensure the seller can document the sale of their moped if property is damaged or someone is injured during its use.